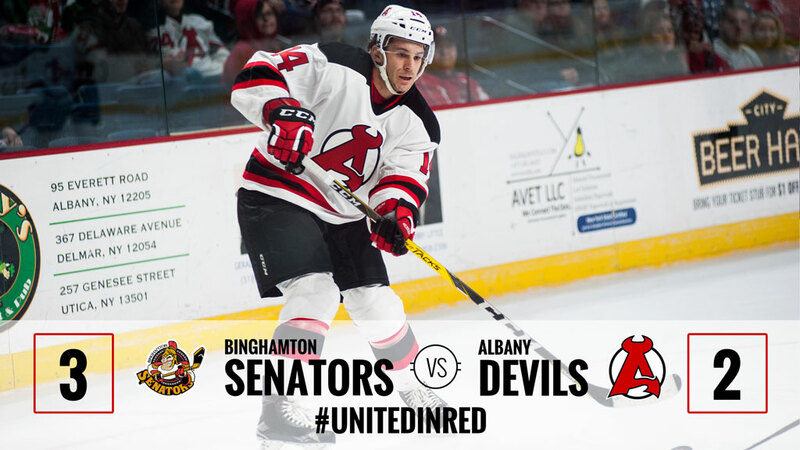 ALBANY, NY — The Albany Devils third period push came up just short in a 3-2 setback against the Binghamton Senators Wednesday at Times Union Center. 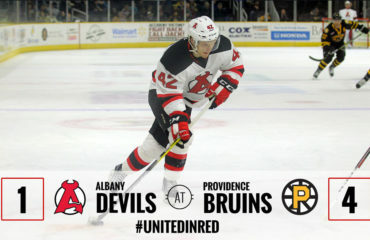 Rod Pelley and Brian Gibbons both scored with less than 11 minutes remaining, but the Devils couldn’t find the equalizer during the final 1:27, playing with a power play and an extra attacker. The Devils suffered just their third loss on home ice and moved to 13-9-0-1 overall. The Senators ended their 7-game skid and are now 6-14-1-1. Pelley started the Devils’ comeback attempt with his fifth goal of the season on a scramble around the net at 9:02. His linemates, Luke Gazdic and Blake Coleman, were credited with the assists. Gibbons followed with a power-play goal with 5:55 remaining in regulation to cut the Senators’ lead to one. He received a pass across the top of the crease from Joe Blandisi and immediately found the back of the net for his fourth tally. John Quenneville had the secondary assist as he and Blandisi lead the team with 18 points each. 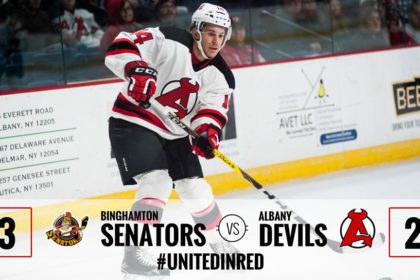 Albany spent the final minute and a half, playing 6-on-4 after Binghamton’s Chad Nehring was whistled for a delay of game penalty after playing a defensive-zone faceoff with his hand. 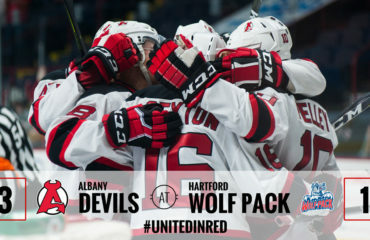 The Devils had their chances, but netminder Matt O’Connor kept them at bay for his third win of the season. He finished with 21 saves. Earlier in the game, Binghamton’s Max McCormick and Casey Bailey gave their team a 2-0 lead during the first period at 5:09 and 13:18, respectively. Kyle Flanagan provided the Senator’s second period goal at 15:08. Mackenzie Blackwood made his 10th start of the season, registering 18 saves on 21 shots. 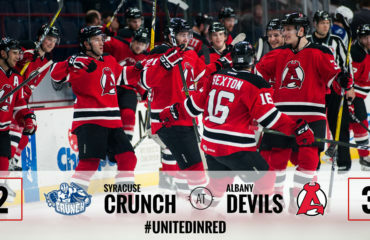 The Devils hit the road for a 7 pm game Friday against the Syracuse Crunch at the War Memorial at Oncenter.